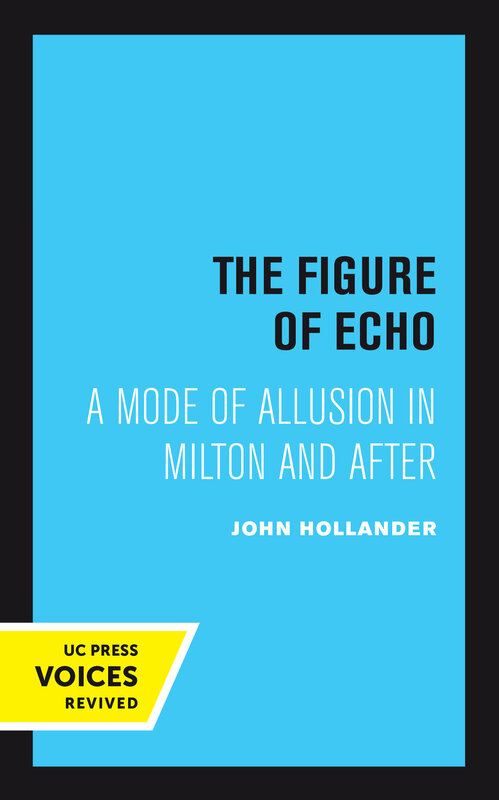 In this essay on "what the imagination has made of the phenomenon of echo,” John Hollander examines aspects of the figure of echo in light of their significance for poetry. Looking at echo in its literal, acoustic sense, echo in myth, and echo as literary allusion, Hollander concludes with a study of the rhetorical status of the figure of echo and an examination of the ancient and newly interesting trope of metalepsis, or transumption, which it appears to embody. Centered on ways in which Milton's poetry echoes, and is echoed by, other texts, The Figure of Echo also explores Spenser and other Renaissance writers; romantic poets such as Keats, Shelley, and Wordsworth; and modern poets including Hardy, Eliot, Stevens, Frost, Williams, and Hart Crane. This book has implications for literary theory and holds great practical interest for students and teachers of American and English literature of all periods. John Hollander was Sterling Professor Emeritus of English at Yale University. He was well known as a critic and historian of Renaissance literature and as a poet. He published numerous critical works, including The Untuning of the Sky and Vision and Resonance, and more than twenty collections of poetry.